One of the most-talked about smartphones at the moment is the LG Nexus 4, offering Google’s pure vanilla Android. Despite the fact that it has been difficult to get hold of since its release late last year, that hasn’t been enough to put people off waiting for it and demand continues to be high. Will that demand be so high though when the HTC M7 comes out, rumored for release later this month? We’re taking a comparison look at the LG Nexus 4 vs. HTC M7 (HTC One), two pretty irresistible devices. If you’re wondering why we have put HTC One in brackets it’s because this phone has also been recently rumored to be launching with the HTC One name instead of the M7, causing a certain amount of confusion. For the rest of this article and for consistency we’ll refer to it as the HTC M7 though. The Nexus 4 is thought to have sold around one million units already and that’s some going, but then this is a highly impressive smartphone with top-notch specs at a reasonable price. The HTC M7 also looks like a very significant handset on paper. Although we have a good idea of what to expect for the HTC M7 from leaks we should point out that none of this is official yet. In our comparison we’ll look at what we think we know so far so please bear that in mind as we take you through some of the key specs and features for each. 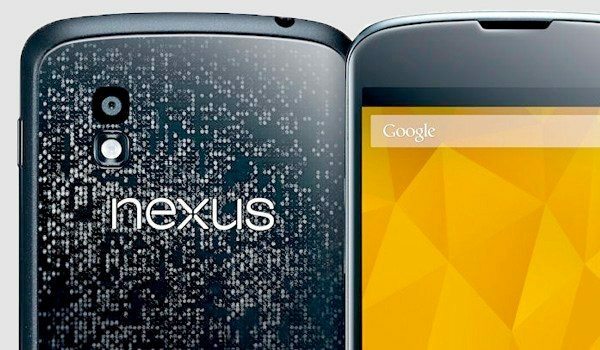 The Nexus 4 is powered by a 1.5GHz Qualcomm APQ8064 Snapdragon quad-core Krait processor. The HTC M7 is thought to have a 1.7GHz Qualcomm Snapdragon S4 quad-core processor. There’s a 4.7-inch True HD IPS Plus display with resolution of 1280 x 768 and 318 ppi. On the other hand the HTC M7 is rumored to have a 4.7-inch Super LCD3 full HD display with a resolution of 1920 x 1080 and stunning 468 ppi. The Nexus 4 has 2GB of RAM and 8 or 16GB of internal storage (non-expandable). The HTC M7 looks like having 2GB of RAM and 32GB of internal storage, with a possible 64GB variant too. We’ve heard mixed reports of whether there will be expandable storage via microSD though so we’ll have to wait and see on that score. You’ll find an 8-megapixel rear camera with 1080p video capture and a 1.3-megapixel front-facing camera on the Nexus 4. The HTC M7 is rumored to sport an impressive 13-megapixel rear camera with 1080p and a front-facing camera of 2-megapixels. The Nexus 4 has a 2100 mAh battery while the M7 is thought to be toting a 2300 mAh battery. As we said before, one of the big appeals of the Nexus 4 is a stock Android experience and the Nexus 4 currently runs Android 4.2 Jelly Bean. It’s thought that the M7 will launch running Android 4.1 Jelly Bean, although we could be surprised and see 4.2 out of the box. It will also have HTC’s Sense 5 user interface. This is where things get sticky. As an example, in the US the Google Play Store is selling the 8GB Nexus 4 unlocked for $299 or the 16GB Nexus 4 unlocked will set you back $349. These prices are a real bargain for such a top-notch smartphone unlocked. It’s also available through T-Mobile and some third-party retailers but at a much higher price unlocked and was originally $199 on a two-year contract if you wanted to go down that route. However yesterday we gave some information on alternatives now available for reduced contract prices (see here for more). The HTC M7 pricing has not been announced so we cannot compare the two. However with such notable specs and going by previous HTC pricing the unlocked price is likely to be a good amount more than the Nexus 4’s extremely competitive price. Obviously we cannot detail every feature and specification here but we have tried to include the major factors for those interested in purchasing either of these phones. The HTC M7 may be a clear winner here as far as the display, cameras and storage are concerned although the Nexus 4 display is still very decent. However we must remember that these specs are not yet official. Unless HTC really shocks us with a low price for the HTC M7 though (extremely unlikely), then the price of the Nexus 4 makes this an obvious choice for many, especially as it’s a Nexus device and so will continue to be one of the first to receive Android software updates. Of course the design of the two phones may ultimately swing your decision and the Nexus 4 has an excellent build quality although the design is nothing to write home about. We have only seen leaked images of the HTC M7 that reveal it may have a unibody design but we’re hesitant to say more until we see it in the flesh. What we do know though is that HTC handsets usually have a quality, premium feel and so as the M7 seems to be so impressive in other areas, this much is also likely for the design and build. We’ll bring you further HTC M7 news as we hear more and that could be at an HTC event to be held on February 19. We’d like to hear what you think of these two smartphones, both of which are extremely appealing. From what we know, or think we know so far, do you favor the Nexus 4 or the HTC M7 (HTC One)? Is it the low price of the Nexus 4 or the fact that it’s a stock Android device its major appeal? If you prefer the sound of the HTC M7, what is it that attracts you most to this phone? Let us have your comments.